Susannah Warden is trapped in a life she doesn’t want. She quit college, put her life on hold to care for her terminally ill mother, made a deathbed promise to look after her father, took over her mother’s dress shop, and got herself engaged to an eligible bachelor. None of these actions reflect what she wants to do with her life. Guilt drives her as she tries to fit the mold her mother created for her. When archeologist, Dr. Perry Elliston, arrives in Tassanoxie to survey a possible historical Indian site, he reminds Susannah of the future she wanted before her mother died. Cuddles wasn’t going to die. Relief slumped Susannah’s shoulders as the door closed behind Dr. Zachary. She may not love the little poodle as much as her mother had, in fact, Susannah barely tolerated the yappy little canine, but that didn’t mean she wished the dog dead. The word dead shattered her relief. It’d been two years since her mother died and Susannah’s mind still danced around acceptance. She scooped the trembling scrap of dog off the metal exam table, cradled it in her arms, and buried her nose in hair tinged with the sweet fruit smell of a recent trip to the groomer. Susannah felt better knowing Cuddles wasn’t at death’s door. When the dog had started coughing the previous evening, she’d visualized all kinds of dreadful canine coughing diseases. She couldn’t lose Cuddles. Her mother would never forgive her if she killed her dog and bankrupted her dress shop. Mary Cecilia Warden might be dead, but Susannah could still feel her eyes boring into her soul. Death hadn’t offered any relief from trying to be the perfect daughter, if anything, it made Susannah try harder. Tears quivered on the edges of her eyes. She wasn’t sure if they were tears of grief over losing her mother, or if they were tears of self-pity because she’d never met her mother’s expectations. Here we go.” Dr. Z’s voice had Susannah squeezing back the potential crying jag, glad her back was to the door he used. Moments later, Susannah found herself at the front desk. She clutched Cuddles in one hand and a bottle of pills in the other. Susannah frowned. She and Jennifer Jerkins didn’t know each other well, but Susannah had graduated from high school with her older sister. She’d been to their house, for heaven’s sake. What was with the Ms. Warden? With a shrug, she set Cuddles on the floor to rummage through her purse. She heard another door along the hall open, but didn’t pay it any attention until a happy bark coupled with a blur of brown, white, and black attacked Cuddles. One moment her mother’s little dog was leaning on her left leg and the next she was knocked on the ground, hidden beneath the wiggling, excited body of another dog. Ohmigod! Susannah freaked. Had she saved Cuddles from a horrible cough to see her devoured by a crazed dog? “Stop it! Stop it! 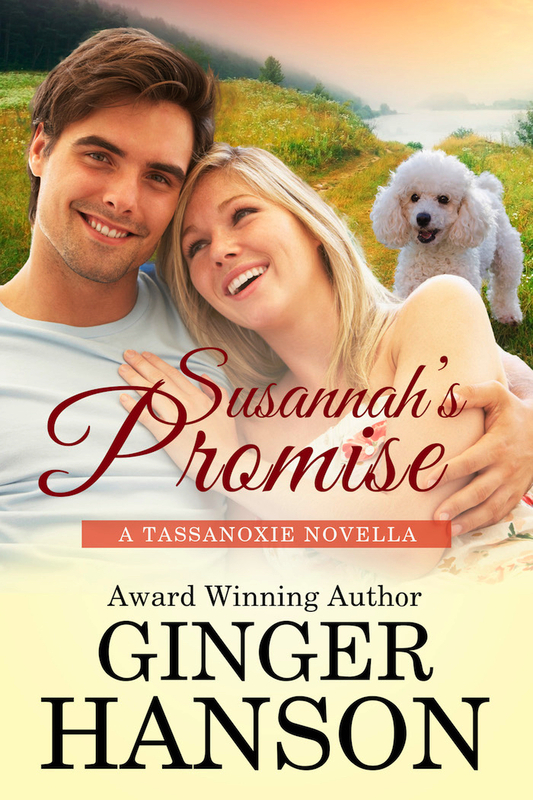 You big beast!” When the dog failed to respond, Susannah, who had never hit an animal in her life, started kicking the bigger dog, trying to save Cuddles. “That so helps,” The woman grabbed the attacking dog’s collar. “He’s just licking her,” the woman snapped. “Darwin can’t help it if he likes silly little poodles with pink bows on their ears.” With a yank, she pulled the dog off Cuddles and into her arms. Susannah grabbed Cuddles off the floor. “Did that mean dog frighten sweet little Cuddles?” She examined the poodle for injuries. No way would she leave the vet office if Cuddles was bleeding, or heaven forbid, pregnant. Susannah wasn’t knowledgeable about doggy pregnancy, but her mother had safeguarded Cuddles from mating because she couldn’t chose the perfect match. If chastity belts had come in poodle sizes, Susannah was sure her mother would have bought one and clamped it on Cuddles. Susannah couldn’t stop a small, horrified gasp. “Every responsible pet owner who is not a professional breeder should have their pet fixed,” the woman added. After a sleepless night punctuated by Cuddles’ coughs and her fear the dog was going to die, Susannah didn’t want to go to the store, but it wasn’t fair to leave Naomi alone at The Style Shoppe. There was always stock to be ordered, paid for, priced, shelved, reshelved, and mended. Advertisements to make, sales to have. The list was endlessly repetitive. She strapped Cuddles into the small dog car seat her mother had found online. Comforted by the familiar surroundings, the little dog curled into a ball, a nap on her agenda. With a sigh, Susannah closed the back door and tried to forget those last few moments in the vet clinic. It was as if a screaming, kicking banshee had possessed her body. She couldn’t figure out what was wrong with her lately. It took more than grief over her mother’s death to explain why she’d kicked a beagle, snapped at his owner, and had Dr. Z’s receptionist talking to her as if she were a stranger. Too often in the past few months, the strands of a life she didn’t want gathered around her, tying her into a life she’d never envisioned for herself. There was no reason to wrestle with might-have-beens. She’d made a promise to her mother and she intended to keep it.